By proposing to merge the playful world of e-democracy with the humourless world of constitutional democracy, Cameron invites one of two outcomes. Either parliament receives an injection of unaccountable anarchy, or the online forum must lose some of its inconsequential lightness. Which is it to be? Some might hope that by bestowing power upon an online forum, that this might spawn responsibility with it and e-citizens would cherish their new-found constitutional rights. This would be quite a gamble. But if it did work, then e-petitions users would suffer a new problem, similar to that experienced by the pigs at the end of George Orwell's Animal Farm : they would gradually become indistinguishable from their old masters. If the e-petitions site were a recognised route into parliament, there is no reason why it would remain different from other routes, that is, dominated by organised lobbying, NGOs, and business. Achieving a sense of due process and rule of law in an age of rapidly developing and often invisible technologies is extremely tough. But attempting to do so, as the European Commission has recently done in engaging the public on RFID tag regulation, is both noble and bold. Why not rethink the rules of information in the digital age from the ground up? That is precisely the sort of optimistic – perhaps over-optimistic – policy that characterised New Labour in the mid and late 90s. From Freedom of Information to data-sharing to privacy rights to surveillance rights, both the public and the State have developed a sense of helpless resignation at the direction policy takes. A new settlement for the digital age is precisely the sort of wide-eyed ambition that ought to characterise a new political era. Earlier today I, er, appeared (was heard? spoke?) on Laurie Taylor's Thinking Allowed programme on Radio 4, to discuss the role of the internet in contemporary politics alongside Andrew Chadwick. You can listen to the programme here - our bit kicks in around the 15 minute mark. Pan-European anti-dementia Second Life spin-offs for geriatrics: What's the role for government? In this report last year, I half wondered whether there was legitimising potential in the quasi-professionalism of the hacker ethic. What I was trying to get at was the possibility that the public-spiritedness of vocational web developers might be harnessed by Government, in the same way as the legal profession, say, was once intended to uphold the public interest (in the days before lawyers banded together only for the purpose of price-fixing). Let's all be political geeks! Want to affirm your support to democracy and Europe? Wear this t-shirt and become a member of the 'Political Geek' community. 'Political Geek' t-shirts are inspired by the popular so-called 'Geek Culture'. 'Geek culture' originated in the Information Technology sector - grouping individuals together who often work in complex fields and use their own codes and jargon. 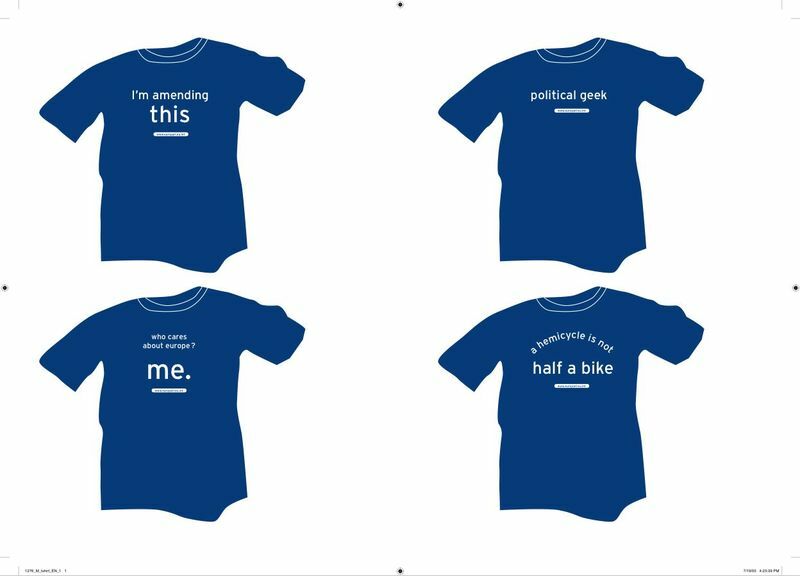 In an ironic, self mocking way, the 'Political Geek' t-shirts play with European jargon. I've had a piece published (click on the link and it will appear, but only once) in the New Statesman this week, as part of a special supplement on criminal justice. It looks at how the use of technology simultaneously makes life easier for victims and witnesses, and tougher for offenders. As I put it in the article, it demonstrates that both Huxley and Orwell were correct about the potential dangers of technological modernisation: it's perfectly possible that computers are both making society more aimlessly satisfying, and removing certain freedoms. The benefits and perils of the digital age usually come as a package. Online shopping may offer a new convenience, but it also brings new types of security risk. In the case of criminal justice, the pluses and minuses of digitisation couldn't be more separately distributed. IT is very good news for the public and very bad news for the offender. As the service to the customer improves, so the loopholes open to the guilty are closed. Whether the digital age is experienced as greater individual satisfaction or as greater state surveillance depends entirely on which side of the law you operate. Now is probably not the time to start getting on a high horse about privacy or civil liberties (I can leave that to Cherie Blair), but surely there must be some cause for concern about an agenda for criminal justice that is so unambiguously proud of (as the Government puts it) "rebalancing of the entire criminal justice system in favour of victims and the community". Surely justice isn't meant to be balanced 'in favour of' anyone. This is where the dark side of the New Labour slogan, 'for the many not the few', starts to rear its head. Public transport passengers in London could soon pay for their newspapers, coffee and car parking fares using Transport for London's (TfL) Oyster travel cards. TfL has shortlisted seven consortia to bid for the Oyster e-money scheme, which will allow commuters to pay for low value goods and services at newsagents, fast food outlets, supermarkets and parking machines. In the same way as Martin Heidegger only really noticed his hammer when it broke, I was without any bank cards recently which made me very aware of the shift from a cash society to a swipe-card society. The obvious thing to say about Oyster cards becoming a substitute for cash is that it infringes privacy, to which the obvious retort is that it is no worse than how credit card companies and loyalty cards operate (zzzzzz....). But the point about privacy is not that Big Brother will snoop on where I buy my chocolate electronically (and if I was a terrorist on the run, I'd be unlikely to use electronic anything) but something about the experience and ethics of public space. As currency becomes invisible and networked, it becomes a form of authentication rather than a form of payment. Doors open, chocolate is handed over, rail cards appear out of machines. I prove that I am legit. It is exactly what Jeremy Rifkin was getting at in The Age of Access: ownership of currency is superseded by the right to pass through. There's also something of the Me++ aspect to it, in that, as a mobile individual bearing tools, I am in constant technological dialogue with the urban environment. As the city gets smarter and wireless technologies get smaller, the individual becomes ever more efficiently churned through transport and infrastructural networks, like one of the balls in Big Loader. Is there anything to prevent the ID card eventually doubling up as a credit/Oyster/access card? That way one could authenticate oneself to anyone who requested it, be it a newsagent, a policeman or an employer. I guess that would be the consummation of the consumer-citizen concept, now increasingly used around government: your ability to pay and your membership of society would become merged into a single form of identity. Yet once one is reduced back to fivers and coins, the city feels very different all over again. One moves from a post-pay to a pre-pay world, in which anonymity is won at the expense of convenience, something the government is convinced 'the public' don't want (William Heath has queried this repeatedly). It is a pain in the arse in many respects, but you do also get that bizarre, slightly retro feeling of being able to wander off into a crowd and be anyone you want, like the first time you go to the shops on your own to spend your pocket money. The flaneur, for instance, would surely have to use real pounds and pence (alright, francs and centimes) rather than an Oyster card or Visa. There is something rather wonderful about cash, in that if money talks, then nothing else has to. Privacy arguments too often revolve around Big Brother vs libertarians, with extreme examples being bandied around by both sides. The ethical experience of privacy - or disconnection from the network - is that of a different type of freedom from the one being offered by the network. It's the freedom to embrace contingency and inconvenience, rather than the freedom to get what you want. I propose a 'Leave Your Wallet and Mobile Phone at Home Day', in which once a year, individuals hit the streets with nothing other than twenty quids worth of low-tech, Victorian cash. Then see what happens. Anyone looking for an example of how e-government improves public services need look no further than the Oyster Card, the smart travel card now used across London’s tube and bus network. The user tops up its credit online, and swipe it quickly over a scanner when entering a station or bus. Ticket office queues disappear, ticket barriers magically open, and suddenly the tube starts to feel user-friendly. Oyster Cards are a success. Londoners have embraced them, and last year they won the New Statesman New Media Award prize for ‘Modernising Government’. But scratch beneath the surface, and one discovers contradictions that characterise this Government’s attitude towards public services. In the current policy climate, e-government is a way of achieving public sector efficiency savings. This is either through reorganising back offices, or through increasing the availability and uptake of more efficient service channels, such as call centres and the internet. Inevitably this involves job cuts, although the rhetorical emphasis is firmly on ‘releasing resources to the front line’. Such is the critical political distinction underpinning current public service reform: that between the ‘bureaucrat’ and the ‘front line professional’. Bureaucracy, according to this thinking, is simply a process, a means to an end. There can be nothing intrinsically ‘public’ about it, and if it could all be automated electronically, then that would be a welcome fiscal achievement. Failing that, it should be relocated to anywhere that has the technological and social infrastructure to carry it out more cheaply. The ultimate goal is the ‘self service’ model of government, in which ‘customers’ use technology to interact with government electronically, where they like and when they like, without the inconvenience of queues or administrative staff. ‘The Front Line’, by contrast, is presented as the home of socially engaged professionals. The celebration of nurses, teachers and policemen plays well in the papers, but there is also something more profound going on. Against a backdrop of automation, relocation and down-sizing, the front-line professional performs the uniquely human functions that machines can’t. According to this mindset, there may be no efficient or convenient way of providing care to the sick, but this is a vocational duty and not an administrative chore. Unlike bureaucrats, government views these precious employees as geographically embedded. Schools have long been seen as the hub of the local community, but the Office of the Deputy Prime Minister has recently promised to engage neighbourhoods in the delivery of other public services. The agendas of public service reform, Active Communities, and New Localism all look set to collide in the form of Neighbourhood Governance. Such is the schizophrenia of contemporary policy. The unfortunate bureaucrat is stigmatised, out-sourced, or automated out of existence. The noble front-line professional, meanwhile, is a sensitive and caring sort who carries responsibility for the very ‘publicness’ of local services. This may be a slight caricature, but it captures something of the key fault line in public services in 2005. And so what has any of this to do with Oyster Cards? The example of Oyster Cards undermines this analysis on two fronts. Firstly, it is by no means clear that successful technology reduces the need for administrative staff at all. Only a small minority of British people embrace technological innovation for its own sake, so most people constantly require help as they grapple with digital infrastructure. The self-service model is not necessarily what the ‘customer’ wants. Fortunately for passengers, tube stations are still run by the public sector, and employ mostly dedicated staff, for long periods at the same station. One wouldn’t term these people ‘front line professionals’; but they are embedded in their communities like teachers, and they accumulate knowledge over time like doctors. So are they ‘back office’ or ‘front line’? Are they part of the Localist agenda or not? On both counts, it isn’t clear. It may be that, over time, people accommodate the technology, and that staff become gradually superfluous. Stations could become hyper-efficient ghost towns, with passengers passing through effortlessly. But here lies the second, more profound tension in current public service thinking: does successful automation of services actually lead to a more satisfied public? Or to put it another way, should convenience be the goal for public services in the first place? Not necessarily. As technology gets better, it becomes invisible, and services more customer-centric. Indeed the only times that the institutions behind successful e-government become noticed is when something breaks – which is where the problem lies. The egocentric Oyster Card holder expects services to revolve around his needs and wishes, and anything related to the day-to-day challenges of managing infrastructure starts to look like intolerable inconvenience. Research on internet banking shows that customers like using the technology precisely because they dislike engaging with their bank. The question is how two quite so divergent agendas will affect one another. How can we be expected to act as engaged and patient citizens around our local school, when elsewhere we have been indulged as impatient and unreasonable consumers? How can a public service ethos be saved at ‘the front line’, when it is being crushed in the arbitrarily-defined ‘back office’? Middle grounds need to be identified. Services are not either face-to-face or electronic, but often a combination of the two. Administration is not inherently placeless and Kafkaesque, any more than local communities are inherently humane and vibrant. E-government needs to rediscover e-democracy, transactional services require a participative dimension. This is by no means straight forward, but the reality of e-government never is.